that the Garden of Eden is in Arkansas? I can see a hawk -- two, actually -- in my back yard circling on the thermals atop the Petit Jean River valley. On top of Arkansas at Mt. Magazine State Park, I can see for miles across, and half a mile down, since the elevation is 2,700 feet. I don't believe I have ever seen this many butterflies in my life. 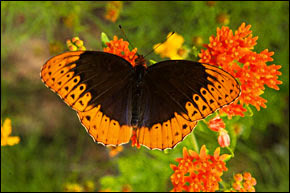 The Diana fritillary is the state butterfly, but it looks a lot like the great spangled fritillary, at least when the novice butterfly watcher sees the orange and black mid-sized butterflies on the wing rather than feeding on, what else, butterfly weed. Or coreopsis. Or coneflowers. Butterflies in paradise. Or maybe it's the hot tub that clinches it. I haven't died and gone to heaven -- just Arkansas. We walked for miles. Marcia, this picture is beautiful. I have a couple other friends coming and going to Arkansas for business and pleasure. I've been there several years ago (fishing with John). Your blog looks great. It does get lonely blogging. I have one too, but I'm not sure of the exact url. You can get there from Linorstore.com and click on Blog.. I'm also doing an ezine and busy beading jewelry for my first show.